Hydraulic equipment is a big investment. Why not protect that investment with expert hydraulic parts & service in Fontana CA from Bernell Hydraulics? Our expert staff has been helping customers just like you enjoy optimal performance from their hydraulic equipment since 1977. Today we have three separate locations to serve you. Please give us call and let us know how we can be of service. We have everything from quality name brand parts from companies like Parker and Lion to more generic parts. We can accommodate virtually every system requirement, from odd metric sizes to extreme temperatures to resistances to chemicals and abrasion. Not sure which part to buy? Let our expert staff guide you towards a reliable and long-lasting part. In addition to providing the parts you need, we can also install those parts as well as provide other important maintenance services. For example, we can provide fluid analysis, fluid flushes, filter changes, and system analysis to help keep your hydraulic equipment performing its best. We even offer 24 hour mobile repair services, so we can repair your hydraulic equipment right at your job site to get you back to work faster. To learn more, please contact us. 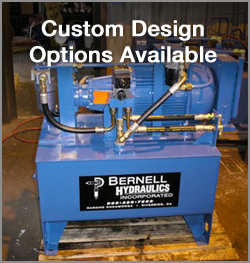 As a manufacturer of custom hydraulic systems, Bernell Hydraulics is ideally positioned to provide hydraulic parts & service in Fontana CA for custom equipment. We can create custom replacement parts and install them for you.